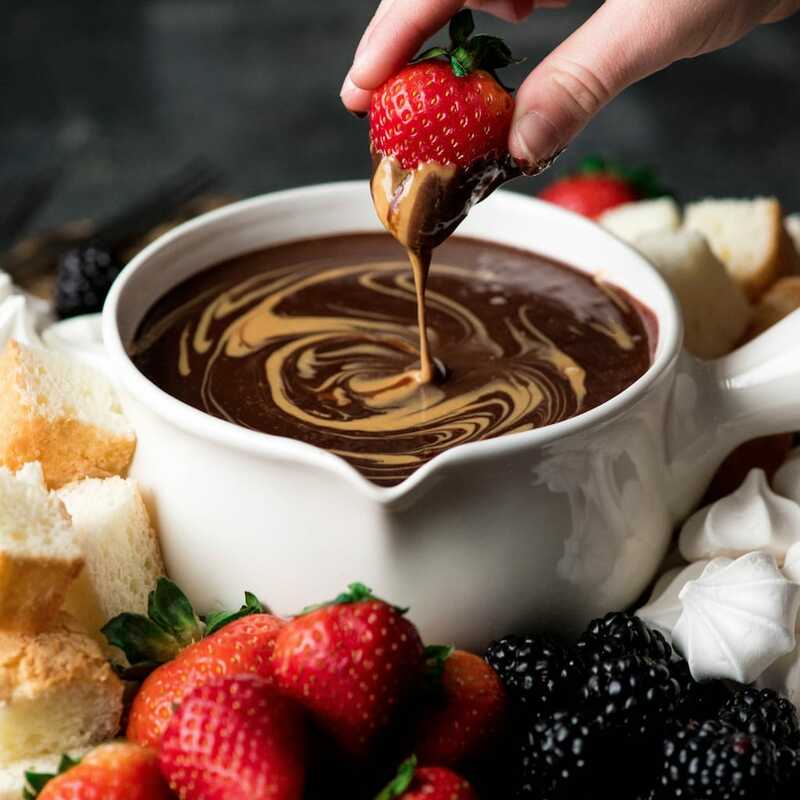 If chocolate & peanut butter is your love language, then you need to make this easy Dairy-Free Chocolate Peanut Butter Fondue recipe! 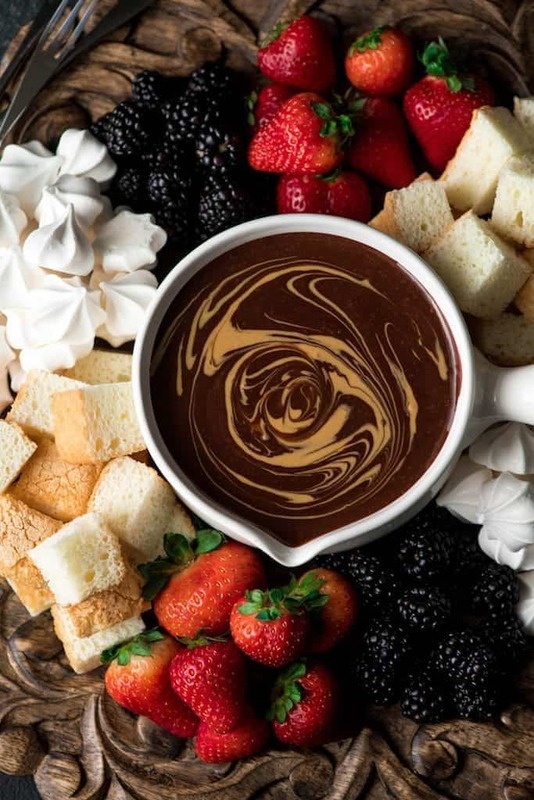 It’s the perfect desert for Valentine’s Day or to serve at a Galentine’s Day Brunch! This post is sponsored by my friends at Crazy Richard’s! As always, all opinions are my own. Valentine’s Day is just around the corner. And even though I’m a firm believer that we should treat every day like it’s Valentine’s Day and show love to the people in our lives always, I do think it’s fun to get extra mushy one day out of the year. Next, can we dish about the flavor?! This velvety smooth pool of rich, creamy chocolate has subtle but satisfying notes of peanut butter in every insanely delicious bite. It is SO good that you will want to savor it down to the very last drop. Everyone in my family absolutely loved grabbing a fondue fork and diving right in! This recipe couldn’t be any simpler! Simply pour your ingredients in a saucepan, warm, whisk and enjoy! 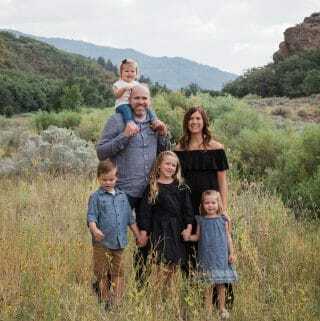 Here are a few tips to help ensure your success! Use the entire can of coconut cream. The solid portion of the can will melt with the rest of the ingredients as it is warmed! You need both the solid and liquid portions of the cream for this recipe! Whisk! Don’t let the mixture sit on the warm burner for too long, or the bottom could burn! Be sure to whisk constantly! While I can’t, in good conscience, recommend that you tamper with this recipe at all, here are a few potential substitutions! Coconut cream. I really do not recommend any dairy-free substitutions for coconut cream because it is critical to the irresistibly creamy texture of this fondue! You could use full-fat coconut milk, but it will be a little less creamy so beware. If you don’t mind the dairy, heavy whipping cream and whole milk also work well in this recipe! Chocolate chips. Any chocolate bar or chip will work well in this recipe! I recommend a variety that’s between 60-72% dark for the ultimate chocolate flavor. However, feel free to choose your favorite variety! Both Enjoy Life Foods and Sunspire Chocolate make chips that are certified dairy-free! Granulated sugar. I recommend organic cane sugar here, but any granulated variety should work well. Use coconut sugar for a refined sugar free option! I do not recommend using calorie-free sweeteners, as I do not use them and cannot guarantee results! 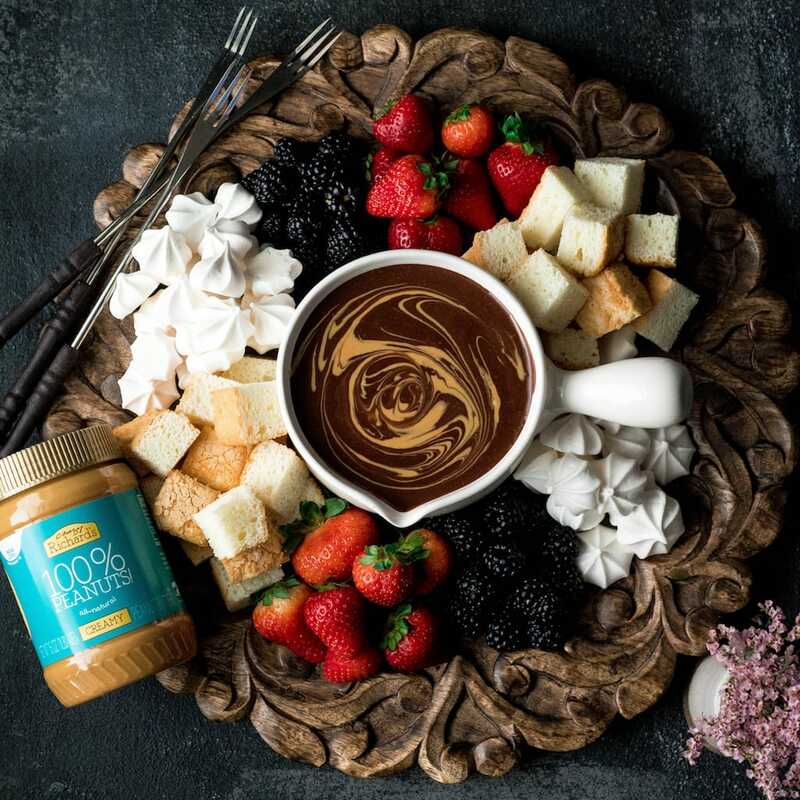 If chocolate & peanut butter is your love language, then you need to make this Dairy-Free Chocolate Peanut Butter Fondue recipe! It's the perfect desert for Valentine's Day or to serve at a Galentine's Day Brunch! Add coconut cream, chocolate chips, peanut butter, sugar and salt to a small saucepan. Heat over medium-low heat until the chocolate chips are melted and the mixture is smooth, whisking every 30 seconds. Add cocoa powder and vanilla and whisk until combined. Transfer to a fondue pot or serving bowl. 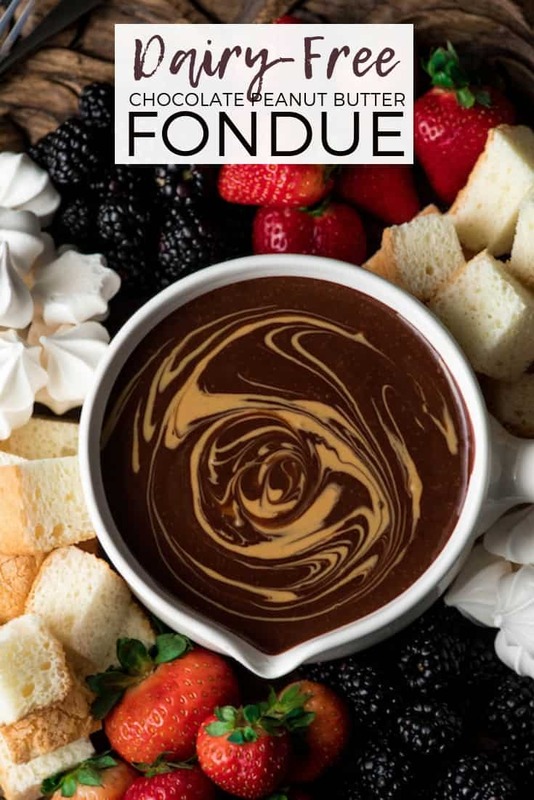 If desired, drizzle an extra 1 TBS of peanut butter in a circular motion on the top of the fondue in the serving bowl for a pretty presentation! 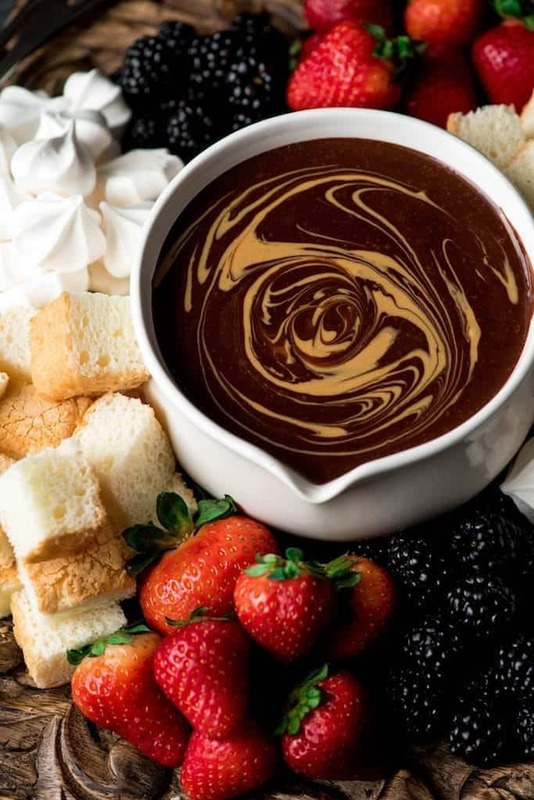 Serve warm with your favorite foods to dip in chocolate! Some suggestions: fruit of any kind, angel food cake, brownies, marshmallows and pretzels! *There are no substitutions for coconut cream. **Or chopped, semisweet chocolate ***Any granulated sugar may be used, including raw, organic, or coconut sugar. What are you making for Valentine’s Day this year? How do you celebrate?! This post is sponsored by my friends at Crazy Richard’s! Thank you for allowing me to continue creating delicious recipes for you by supporting partnerships with amazing brands that I LOVE. As always, opinions are completely my own! I kind of just want to drink some of this or drizzle it over everything. 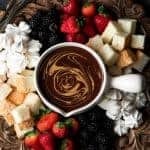 Some of my favorite chocolate bar brands are dairy free; I’d love to try making this for Sunday!